At the heart of the exhibition lies a concern with the elusiveness of meaning and the struggle for creative expression. The works included take the form of blank sheets of paper or gesture towards the narratives they invoke. Pages accumulate and dissipate, are torn and re-paired, burned-through, hidden from view, deleted, crumpled, tossed away and falling through space as if through boredom, frustration, despair, intense physical exertion or playfulness, elation and delight. 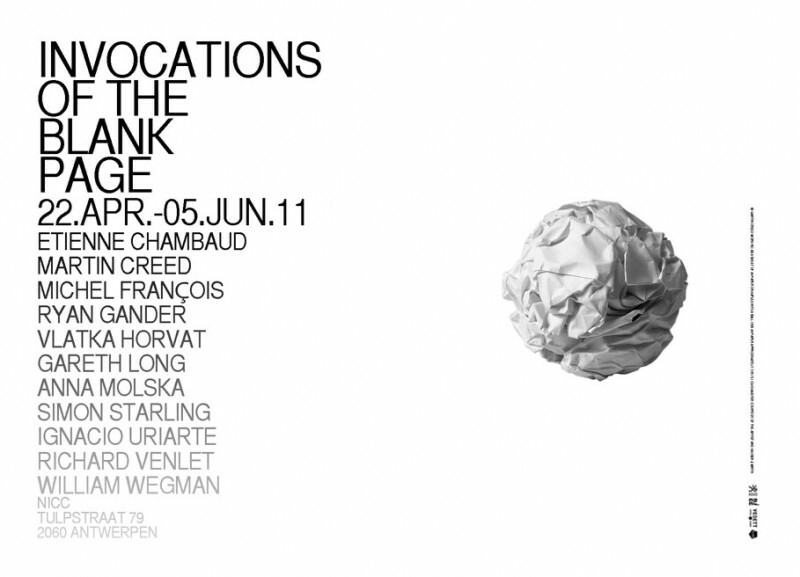 The exhibition includes the work of: Etienne Chambaud, Martin Creed, Michel François, Ryan Gander, Vlatka Horvat, Gareth Long, Anna Molska, Simon Starling, Ignacio Uriarte, Richard Venlet and William Wegman. 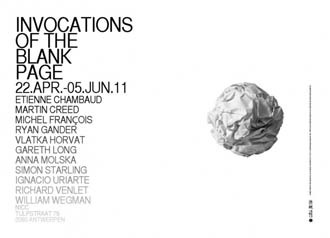 Invocations of The Blank Page is an exhibition curated by Frances Loeffler.